The product range consists of a low foam and a high foam solution both of which offer all of the key performance characteristics outlined below. The Low Foam Cleaner and Sanitiser is designed to provide a hygiene and cleaning solution for horizontal and vertical surfaces that do not require prolonged chemical contact times. The High Foam Cleaner and Sanitiser is designed for vertical surfaces where prolonged chemical contact times are required to firstly wet and then remove dried on protein and organic debris. These products are designed to be applied either manually or through a CIP spray system or via high pressure washing machines or floor scrubbers. The Bioguard Heavy-Duty Non-Hazardous range of products have been formulated to provide a user friendly non-hazardous alternative to the more traditionally used caustic, chlorinated and oxidising compounds. Ease of Use – Our products provide a single combined cleaning and sanitising action, eliminating the usual multi-phase operations of pre-rinse cleaning, post-rinse cleaning, pre-rinse sanitising and post-rinse sanitising which are common for many of the alternative cleaning systems. Host Surface Integrity – Bioguard products will not cause damage or degradation to surfaces, such as the corrosion of stainless steel and aluminium components, stress fractures in plastic surfaces or the blistering of painted surfaces. Superior Cleaning Action – The products incorporate a heavy duty cleaning and sanitising agent which emulsifies fats, oils, starches and other organic debris, significantly quicker than the more traditionally used chemicals. This reduces cleaning times and optimises plant availability. Non-Hazardous – Our product range is non-hazardous and will therefore present significantly greater Health & Safety benefits in terms of operator risk assessments, product preparation, product use and storage of chemicals. 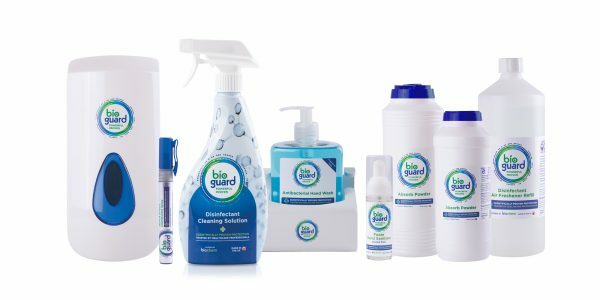 Safe To Use – Bioguard products do not contain caustic based solutions, chlorinated compounds or oxidising agents thus eliminating the risk of chemical burns, skin irritation and sensitisation. Impact on Effluent – Our products have been formulated to include a unique Quick Break Emulsification feature which significantly reduces the chemical oxygen demands (COD’s) and biological oxygen demands (BOD’s) whilst maintaining a relatively neutral pH. These benefits will assist in compliance with the increasingly stringent effluent consent levels imposed by EEC legislation and may additionally reduce effluent and water charges. Versatility of Our Products – Through working in partnership with our customers, we have found that the versatility of our products has in some cases enabled us to rationalise their chemical usage. In one recent case a customer manufacturing dessert products for a major supermarket was able to reduce the number of cleaning chemicals from three caustic based and one acid based hazardous products replacing them with our single lo-foam non-hazardous cleaning sanitiser. Incidental Food Contact – Our products are classified as safe for incidental food contact. This eliminates the risks associated with cross contamination of the cleaning chemical and food produce and also allows clean down work to be undertaken during production operations. Customised Cleaning Solutions – Where conventional Bioguard products do not provide effective cleaning and sanitising control we can work in partnership with users to consider site-specific problems and where appropriate formulate customised solutions.